Attendees head into the show’s exhibit hall. 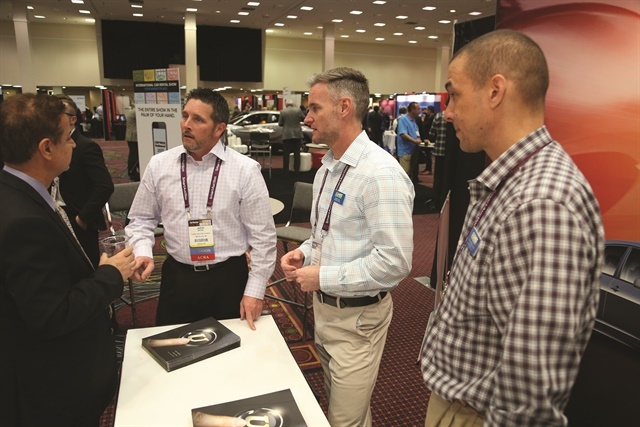 There were several opportunities for attendees to interact with various suppliers and vendors. Photos by Steve Reed and Amy Winter-Hercher. The International Car Rental Show (ICRS) could be likened to every holiday and family reunion rolled into one — there’s meticulous planning, plenty of stress, and inevitable bickering between “family members,” but it all culminates in strengthened relationships, new understandings, and the passing of knowledge from wise ones to the novices. And of course, Vegas, baby! Today, the topic is unavoidable. Yes, autonomy and a driverless future were discussed — though the great majority of the conversations focused on the shifting dynamics in transportation happening right now. 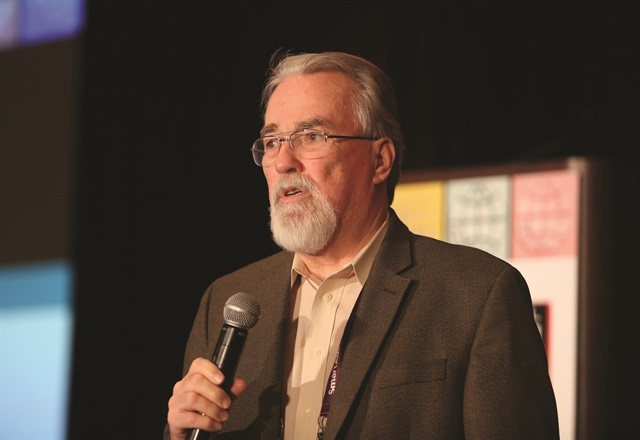 The opening keynote, titled “Car Rental and the Future of Mobility,” was a panel comprised of North Holbrook of Volvo, Mark Thomas of RideCell, and Dan Langford of the Nevada Center for Advanced Mobility (Nevada CAM). The panel addressed how changes in transportation models would affect car rental, and how operators should position themselves to take advantage. One theme that ran through the keynote and elsewhere was that while technology is enabling new models that are challenging traditional ones, it is also facilitating ways for standard car rental companies to streamline traditional processes through “on-demand rentals” — without reinventing the wheel. Chris Brown, executive editor of Auto Rental News, moderated the opening keynote panel on car rental and the future of mobility. The panelists included (l to r) North Holbrook of Volvo Cars of North America, Mark Thomas of RideCell, and Dan Longford of the Nevada Center for Advanced Mobility. 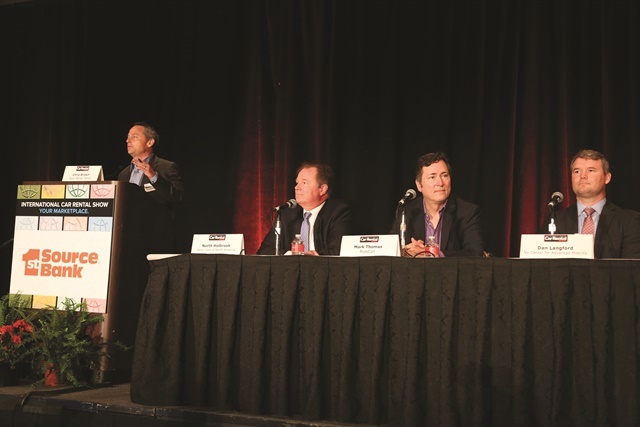 Among many topics and trends, the keynote panel discussed three developments to keep an eye on: “asset light” lifestyles, Mobility as a Service (MaaS), and auto manufacturers as service ­providers. As populations continue to migrate to cities, they adopt asset-light lifestyles and shun car ownership. Yet, they still need transportation. Car rental is poised to take advantage as one mode of the transportation spectrum. The intent of MaaS is to connect various modes, including public transportation, carsharing, ride hailing, biking, and standard car rental under one user account. Car rental should be aware of municipalities’ role in these public/private partnerships, the panelists said. Carmakers have now become service providers with their numerous mobility initiatives — which include not only carsharing but group leases, ride sharing, and fleet solutions — though the jury is still out on whether carmakers want to manage these offerings on a grand scale. One path would be for car rental companies to leverage their expertise in fleet management to partner with OEMs in these new service offerings. These types of partnerships could also include small businesses, which know how to manage fleet and engage their local customer base. 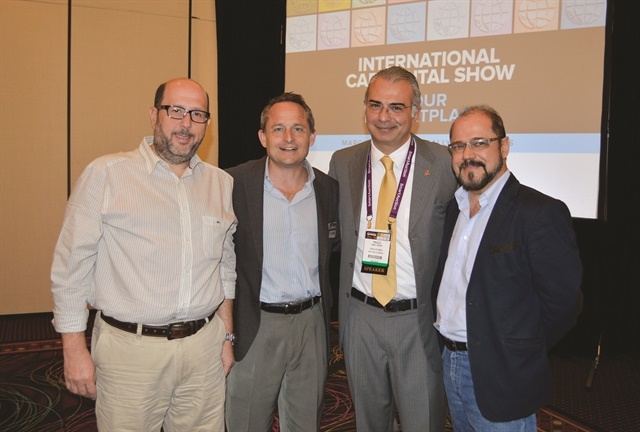 As ICRS welcomes international car rental providers, the theme of “mobility” weaved its way through presentations concerning transportation issues in growing urban environments across the globe. In the Latin American Meeting, Paulo Gaba of FENALOC, the Brazilian car rental association, revealed the problems in Sao Paulo: getting through the airport is a hassle, traffic cameras deliver electronic fines, parking is expensive, and driving after one beer could result in arrest. In this environment, ride hailing makes sense. However, “Brazil is an extremely regulated transportation market, but Uber is hardly regulated,” Gaba said. 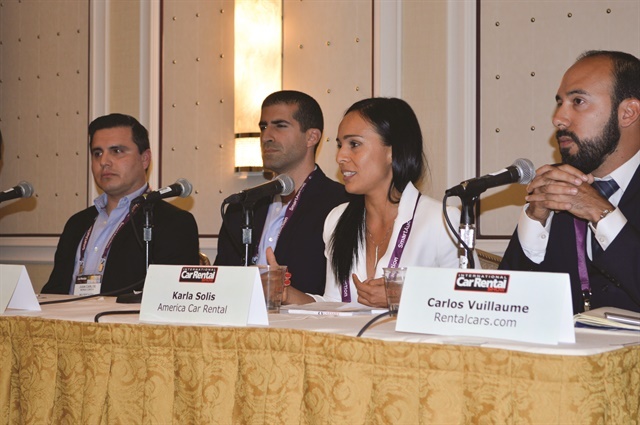 A panel during the Latin American Meeting (Juan Carlos Morga of Mex Rent-A-Car; Alejandro Muniz of Economy Rent A Car; Karla Solis of America Car Rental; and Carlos Vuillaume of Rentalcars.com) discussed ways to promote greater transparency to car rental clients traveling to Latin America. In another Latin American seminar, Javier Garcia of Mex Rent-A-Car echoed Gaba’s points on the lack of transportation options in the Mexico City megalopolis. This has fueled Uber’s growth, though with a similar lack of regulation compared to traditional modes. While regulations are lacking in some areas, seemingly draconian ones are forcing new solutions in others: While Helsinki is considering banning all cars except electric ones, no diesel cars will be allowed to enter Paris starting in 2020. Sao Paulo and Bogota, Colombia, have similar emissions restrictions. Learning that a London driver loses 101 hours a year in traffic, the impetus for change becomes clear. For Europcar — part of the ICRS agenda for the first time — these restrictions represent opportunity. Europcar’s Marcus Bernhardt presented the company’s various mobility initiatives, which include app-based door-to-door delivery, all-electric carsharing, and a corporate ride-hailing service. Wes Hurst and Leslie Pujo addressed new mobility solutions from the legal, liability, and regulatory standpoints. They conveyed the idea of taking cautious steps with new business models. “Stay in your lane, but keep up with technology that improves your processes and customer experience,” said Pujo. In this arena today, there are more questions than answers. Continuing Gaba and Garcia’s theme, “Laws and insurance rules always lag behind when new business models are instituted,” said Hurst. 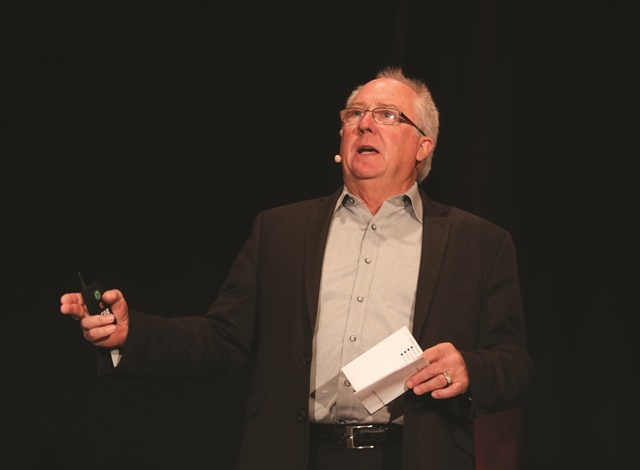 As the general sessions at this year’s ICRS took a look forward, the concurrent seminars dove into how car rental operators can streamline their businesses and boost revenues right now. Attendees had the opportunity to choose from several concurrent sessions, with time at the end set aside to ask questions. 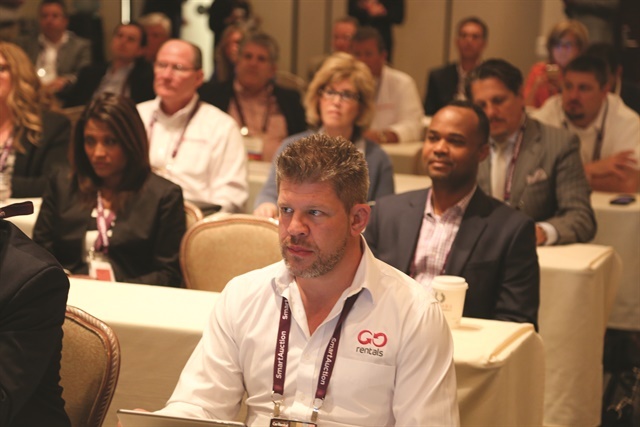 While assessing technology and ensuring proper implementation is a growing concern today, many seminars offered solutions that involved little to no expense. In an era when technology encroaches into every facet of business life, it is refreshing to understand that there are still traditional, no-cost, evergreen solutions to incorporate that can make a difference. 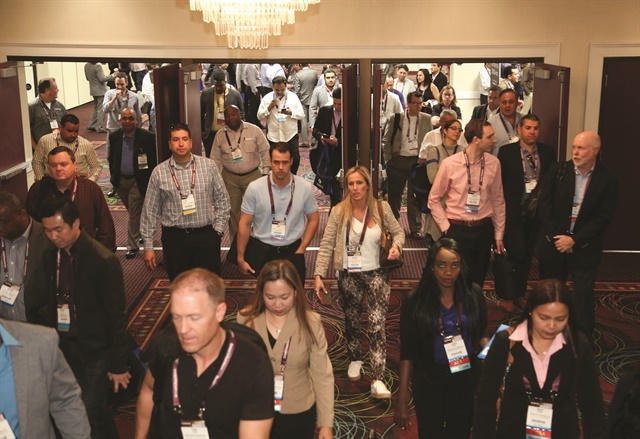 In the closing general seminar, Mary Ann Sena-Edelen of MGM Resorts recounted how a recent rental transaction broke down in many facets of the experience. Mary Ann Sena-Edelen of MGM Resorts International presented the closing keynote session. She shared tips from the hospitality industry that rental companies could use to inspire employees' performance and improve renters' experiences. However, when she pulled up to the guard gate to exit the rental lot, the checkout employee engaged her with a smile and was helpful with directions and information on services. “That little bit of human engagement just about overcame all my negative experiences up to that point," she said. 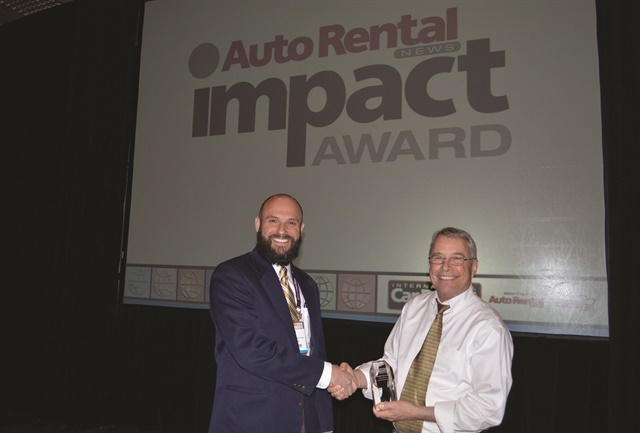 At the 2017 International Car Rental Show, Michael DeLorenzo received the inaugural Auto Rental News Impact Award for outstanding service to the auto rental industry. Michael DeLorenzo, executive vice president of International Franchise Systems (right), received the Auto Rental News Impact Award. Jon Dill, contact center director at IFS, presented DeLorenzo with the award. 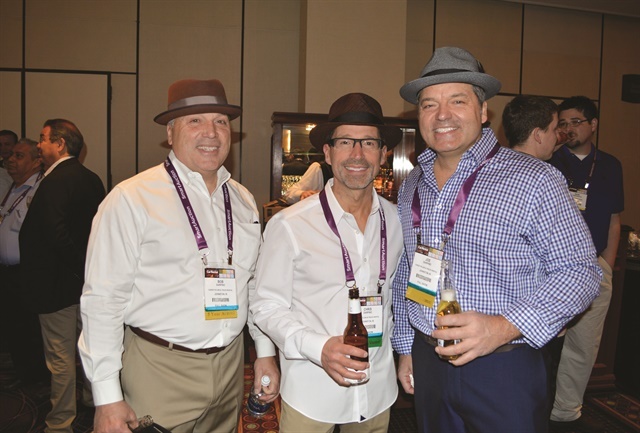 DeLorenzo serves as the executive vice president of International Franchise Systems (IFS), which owns the NextCar, Priceless, and Rent-A-Wreck brands. He is also a member of the board of directors of the American Car Rental Association (ACRA). After starting as a Budget franchisee and selling to auto dealer Jack Fitzgerald, DeLorenzo was instrumental in building an independent brand called NextCar, which operates 15 locations in the mid-Atlantic region. DeLorenzo was put in charge of Rent-A-Wreck of America and Priceless Car & Truck Rental after Fitzgerald acquired them in 2006. Those brands currently have more than 150 franchise locations. DeLorenzo oversaw the launch of International Franchise Systems in 2015, which unifies the NextCar, Rent-A-Wreck, and Priceless brands. In 2016, Franchise Business Review named Rent-A-Wreck as one of the 50 Best Franchises for franchise satisfaction. DeLorenzo has been consistently active with legislative issues related to car rental, including helping the industry in Maryland to fight unsustainable costs after a tax credit for car rental companies was legislated away. Jon Dill, contact center director at IFS, presented DeLorenzo with the award. The 2017 ICRS featured seven hours of exhibit hall interaction. Here, the team from U-Save Car & Truck Rental confers with a visitor to the company’s booth. Joe Knight, president of ACRA, introduced Bill Marmion as the guest speaker for ACRA's General Session. Paulo Gaba (second from right) of FENALOC, the Brazilian car rental association, poses with two associates and Chris Brown. Gaba gave an update on the Brazilian car rental market during the opening seminar at the Latin American Meeting. Bill Marion, principal and partner of Purdue Marion & Associates, shared insights into how ACRA can effectively communicate on a state and federal level. 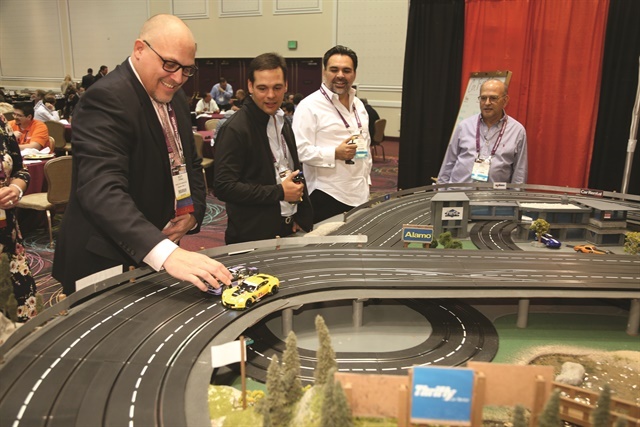 In the exhibit hall, PurCo Fleet Services’ booth featured a fun zone with remote-controlled car races. A winner was announced each hour. Bob (left), Chris, and Joe Darpino of Christy’s Car & Truck Rental in Johnston, RI mingle at Monday evening’s welcome reception cocktail hour. Several vehicles were on display in the exhibit hall. 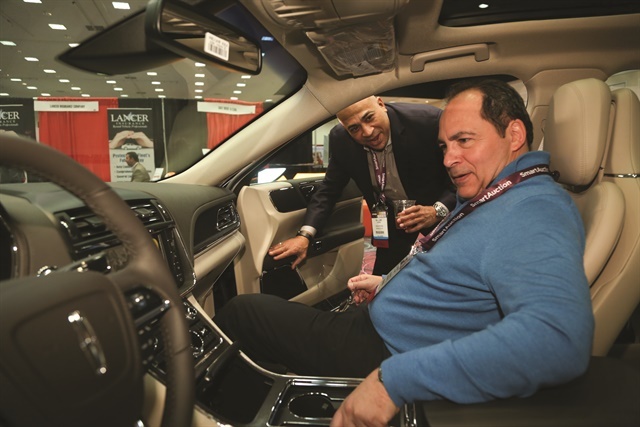 Attendees had the chance to sit in the vehicles to get a feel for the in-cabin features and technology.